Whitley V tri-strand necklace with smoky quartz and gold dusted beads by Bryan Vaigneur, $135 at Copper Penny. Twisted rope necklace connected with 9mm bullet shells; recycled electrical wire bent around a river jasper stone by Mackenzie King, $185 at Art Mecca. Vintage necklace detailed with removable pendant accented with diamonds and rubies, $1,595 at Swoon. Leather strap necklace with black horn by Betsy Pittard Designs, $68 at Teal. Inlaid buffalo tusk necklace with gold-filled clasp by Jenny Thomson for Theodosia, $240 at Theodosia. Necklace made from a vintage belt buckle and smooth garnet ovals by Jenny Thompson for Theodosia, $395 at Theodosia. One-of-a-kind Sterling silver and copper magnesite Cavortress original, $48 at Cavortress. Suede strap necklace with a naturally shed double point antler and African trade beads by Twine and Twig, $238 at Finicky Filly. Suede strap necklace with a horsehair tassel and hand-carved wood beads from the Philippines by Twine and Twig, $138 at Finicky Filly. Handmade earrings carved from bone by Maggie Orli for Bahgsu Jewels, $58 at Seeking Indigo. Gold chain link necklace with dark blue and turquoise faceted gemstones by Blue Sky, $38 at Thera M.
Handmade Metal Monk necklace featuring vintage wood, turquoise, and carved bone by Donya Lynn O'Brian, $150 at Calypso. Hand-dyed horn, wooden beads, and steel nuts necklace by Teresa Goodall, $78 at Ellington. 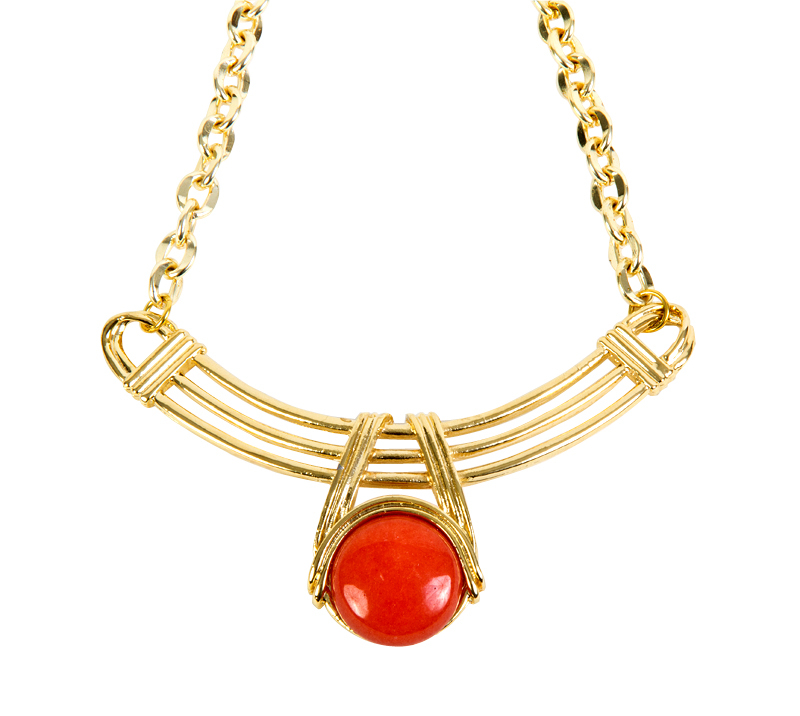 Gold plated adjustable necklace by Jessica Elliot, $85 at Luna. One-of-a-kind Baltic Sea amber ring by Uniquing Company, $105 at Skatells. Tasseled necklace with brass detail by Towne and Reese, $38 at Simply J Boutique. Black and gold bib necklace by Haute Hanger, $22 at Haute Hanger. Aquamarine faceted stone earrings by Heather Tiller for Filigree, $80 at Filigree. 1950s pendant bracelet by Heather Tiller for Filigree, $90 at Filigree. Adjustable leather strap with pyrite stone by Heather Benjamin, can be necklace or bracelet, $391 at Gwynn's. 8. Faux leather “Logan Gunmetal“ bracelet with gold-tone accents by Meghan Brown, $32 at Thera M.